Bernard Buffet was a French painter of Expressionism and a member of the anti-abstract art group "L'homme Témoin" (the Witness-Man). Buffet was born in Paris, France, and studied art there at the École Nationale Supérieure des Beaux-Arts (National School of the Fine Arts) and worked in the studio of the painter Eugène Narbonne. Among his classmates were Maurice Boitel and Louis Vuillermoz. Sustained by the picture-dealer Maurice Garnier, Buffet produced religious pieces, landscapes, portraits and still-lifes. 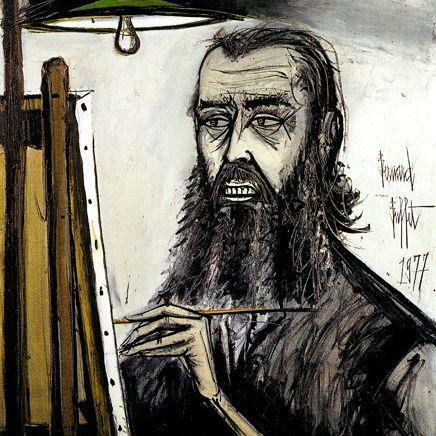 In 1946, he had his first painting shown, a self-portrait, at the Salon des Moins de Trente Ans at the Galerie Beaux-Arts. He had at least one major exhibition every year. Buffet illustrated "Les Chants de Maldoror" written by Comte de Lautréamont in 1952. In 1955, he was awarded the first prize by the magazine Connaissance des arts, which named the 10 best post-war artists. In 1958, at the age of 30, the first retrospective of his work was held at the Galerie Charpentier. Pierre Bergé was Buffet's live-in lover until Bergé left Buffet for Yves Saint Laurent. On 12 December 1958, Buffet married the writer and actress Annabel Schwob. His daughter Virginie was born in 1962, and later, daughter Danielle in 1963. His son Nicolas, was born in 1973, the same year that he was named "Chevalier de la Légion d'honneur". On 23 November 1973, the Bernard Buffet Museum was founded by Kiichiro Okano, in Surugadaira, Japan. At the request of the French postal administration in 1978, he designed a stamp depicting the Institut et le Pont des Arts – on this occasion the Post Museum arranged a retrospective of his works. Buffet created more than 8,000 paintings and many prints as well. Buffet committed suicide at his home in Tourtour, southern France, on 4 October 1999. He was suffering from Parkinson's disease and was no longer able to work. Police said that Buffet died around 4 p.m after putting his head in a plastic bag attached around his neck with tape.